Brunch being a frequent occurrence on my Sunday afternoons, I’ve indulged at many spots all over NYC, only recently to discover that I consistently seek out one dish in particular: Shakshouka (Spicy Tomato Sauce Poached Eggs). There’s something about the soft yolk of the poached egg folding into the simmering, hearty tomato sauce- the leftovers sopped up with toasted slices of warm pita- that I just can’t get enough of. So as you can imagine, I was over-the-top thrilled to learn that these amazing eggs are super easy to make at home, while preserving every bit of deliciousness found in their restaurant-made counterpart. Shakshouka is a traditional Mediterranean dish of eggs poached in a spicy tomato sauce with chili peppers, onion, and cumin. It is also known as Tunisian Eggs, after the country it is believed to have originated from. I know tomato sauce doesn’t usually join us for breakfast, but the combination of eggs and sauce is truly magical here. I almost don’t know how I can return to the standard eggs with ketchup! The onions, peppers, tomato, cumin, paprika and cayenne add serious heat and flavor plus a hearty serving of veggies. 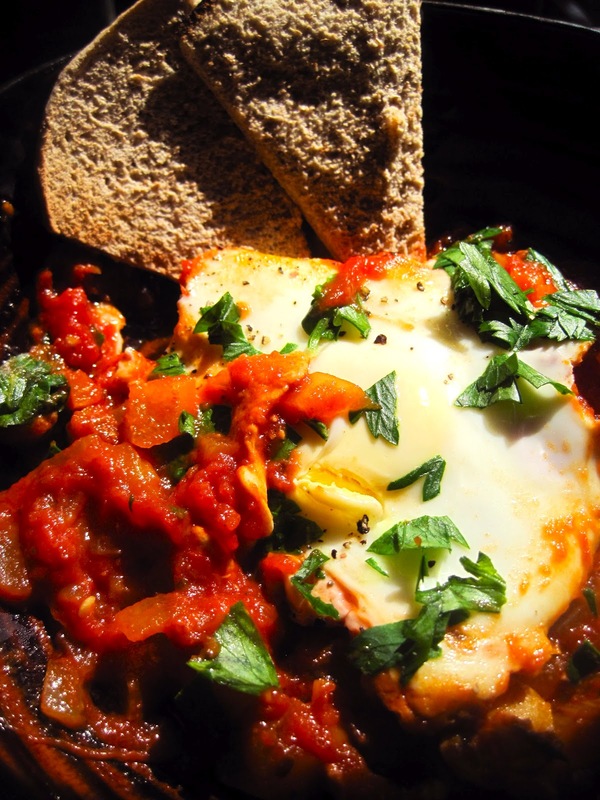 Eggy brunch is usually a cholesterol nightmare, but Shakshouka is actually totally healthy: No butter to be seen with the olive-oil tomato base, vegetables are in abundance, and whole-wheat pita contributes a nutrient-filled grain. You can easily substitute egg whites for your poached egg to totally eliminate bad fats here, but I recommend keeping at least one- mixing it into the savory sauce is not something to be missed! 1. Heat olive oil in a large skillet over medium heat. Add onion, and saute for 2 minutes. Add bell pepper and cook for 5 more minutes, until vegetables are softened. Add cumin paprika, and cayenne; cook for 2 more minutes. 2. Turn heat to low, and add tomato sauce. Slowly pour in water until the sauce consistency resembles a thick sauce, juicy but semi-solid. 4. Remove each egg from the skillet (serve 2 eggs per person) with a generous amount of sauce. Sprinkle with parsley, salt, & pepper (add hot red pepper flakes too if you like heat.) Serve with toasted pita wedges to scoop up excess sauce.